Ska Brewing isn’t new to the canning game, as it was right behind Oskar Blues in starting the craft can revolution, but now the Colorado brewer is taking its entire flagship lineup aluminium. So long, bottles. Hopefully you guys can still be friends. The new cans officially made their debut March 1, including Decadent and two of Ska’s most award-winning beers: Buster Nut Brown and Steel Toe Milk Stout. We hold the same enthusiasm. There is still some room for glass in the Ska family though as the brewery will continue to offer its Robust Reincarnations (Decadent Imperial IPA, Nefarious Ten Pin Imperial Porter and True Blonde Dubbel), in 22-ounce bombers, along with certain limited edition beers. For cans specifically, YTD the industry as a whole has experienced slightly over 2 percent growth in the Alcoholic Beverage Segment, according Skotleski. In 2015, Crown is projecting can sales for the craft market to finish up 56 percent vs. 2014. 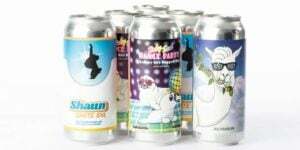 From the innovation side, Skotleski expects to see more and more breweries experimenting with a variety of graphics capabilities (inks and varnishes) and some larger breweries trying specific labels in the sleek-styled can size vs. the traditional standard 12- and 16-ounce cans. So, as we head into 2016, much like the craft brewing industry, do not expect the canning craze to slow down. “From a marco, industry-wide perspective, I would expect 2016 to continue down the path of acquisition for larger, regional craft breweries. I would not be surprised to see regional breweries continue to expand their distribution footprint and open additional facilities to become national players. I am also optimistic that the larger craft breweries that up until now have focused traditionally on glass, will make a bigger push into cans,” Skotleski said.